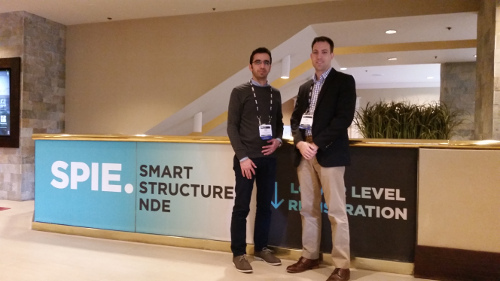 DSSL presents five technical papers at the 2017 SPIE Smart Structures & Nondestructive Evaluation conference held March 26-29, 2017 in Portland, OR. Both Dr. Anton and Mohsen Safaei were in attendance. Safaei, M. and Anton, S. R., Analytical and Finite Element Performance Evaluation of Embedded Piezoelectric Sensors in Polyethylene, Proc. SPIE, 2017, (12 pp.). Hoummadi, E., Safaei, M., and Anton, S. R., Design, Analysis, and Fabrication of a Piezoelectric Force Plate, Proc. SPIE, 2017, (11 pp.). Tefft, E. C., and Anton, S. R., A Multiple Degree of Freedom Model of Piezoelectret Foam in an Updated Multilayer Stack Configuration, Proc. SPIE, 2017, (13 pp.). Scheyer, A. G. and Anton, S. R., Impedance Based Structural Health Monitoring of Additive Manufactured Structures with Embedded Piezoelectric Wafers, Proc. SPIE, 2017, (10 pp.). Poissenot-Arrigoni, B., Scheyer, A. G., and Anton, S. R., Determination of Orthotropic Mechanical Properties of 3D Printed Parts for Structural Health Monitoring, Proc. SPIE, 2017, (9 pp. ).